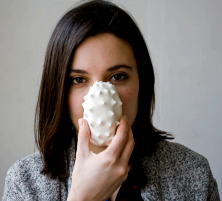 Ceramic artist based in Bilbao. I graduated in Fine Arts at the UPV-EHU, Leioa. I studied an MA Master’s Degree in Ceramics (UPV-EHU) and carried out an internship in Sargadelos, porcelain design company. I am currently pursuing a PhD in Contemporary Art, researching on feminist ceramic practices from the 70s and 80s until today. I am engaged in an Art based Research project, in which I combine art history and theory with my own interdisciplinary artistic practice. My works are mainly sculpture in ceramics, photography and performance. Cofounder and organizer of Spoken Word Bilbao, team members are Laura Sam, Gaizka U. Loroño, Luis Menéndez, and Alain Torres. A non-conventional poetry event, which began in April, 2015. We have created Psicoclavo Fanzine, a booklet which combines poetry, illustration, and diverse 2D art. 2018 | Bilbaoarte Foundation Art Production Grant. 2017 | Visual Arts Grant, Basque Government. Project: “Embrace ornament as a language for insurrection”. 2015 | ERTIBIL prize, selected work, Diputación Foral de Bizkaia, Basque Country. 2015 | ARTESHOP, third prize, Bilbao. 2011 | Séneca scholarship to study at the University of Barcelona (9 months). 2010 | ZINTZILIK, second prize, Amorebieta. 2015- | Currently pursuing a PhD in Contemporary Art at the Sculture Department, Fine Arts Faculty, Universidad del País Vasco, UPV-EHU. 2015 | Internship at Sargadelos O’Castro, Galicia. 2015 | Master’s Thesis “Poetic body actions; from writing to performance” Director: Inmaculada Jiménez Huertas, UPV-EHU. 2014-2015 | MA Master’s Degree in Ceramics, Art and Function, UPV-EHU. 2014 | Master’s Thesis “Caress an image. Deflecting mimesis of body image” Director: Inmaculada Jiménez Huertas, UPV-EHU. 2013-2014 | MA Master’s Degree INCREARTE, UPV-EHU. 2011-2012 | Graduate studies at Universidad de Barcelona, UB. 2007-2012 | Graduated in Fine Arts, Universidad del País Vasco, UPV-EHU. Solo exhibition Light Grenades, Dock, Uribitarte, October 2017, Bilbao. Selected at Getxoarte 2017, Las Arenas, November 2017. Exibition No mercy for craft with Maitane Ochoa, Expogela, BilbaoHistoriko. Custom design ceramic art for El Hule, Portugalete. Collective exhibition Caleuche, organized by ARMAR, Chile. Participated at Guillotina fair, Dabadaba, Donosti, Junio. Individual performance Primitivo Civilizado, Sarean, Bilbao. Participated at BALA fair, Diciembre. Selected work, STRIPART 2016, Barcelona. Solo performance Objeto-Sujeto, BLV-ART, Bilboarte, Bilbao. Installation Memoria Real ARTESHOP 2016, PC Box, Bilbao. Custom design ceramic art for ARIMA restaurant, Bilbao. Exhibition NÓMADA, Provincial Council of Biscay, Bilbao. Collective performance Las Bastardas, Histeria Kolektiboa, Bilbao. Collective exhibition Feria de Arte, La Cosmos, Bilbao. Performance collaboration with Ramón Churruca, Gau Irekia, Bilbao. Collective exhibition Miscellaneus, Paraninfo de La UPV-EHU, Bilbao. Collective exhibition ERTIBIL, Sala Rekalde, Bilbao. Selected design PÍKARAS, Galería MUTUO, Barcelona. Collective exhibition, alumnado de Másters de BBAA, Paraninfo de la UPV-EHU. Collective exhibition Cerámica bajo la escalera, Cuenca. Collective exhibition Cuerpo 1100o en el Hotel Domine, Bilbao, Enero 2015. Collective exhibition The Art of Living, ZAWP, Zorrozaurre, 2014. Collective exhibition Regreso al Origen II, espacio CIVIVOX, Pamplona, 2014. Solo exhibition, Skolástika, Bilbao, 2014. Collective exhibition The Art of Living, ZAWP, Zorrozaurre, 2013. Collective exhibition, Concurso de Pintura Hotel Carlton, Hotel Carlton, Bilbao. Collective exhibition, Espejismos con Sandra Rilova y Andrea Abalia Sala municipal de exposiciones, Barakaldo, 2013. Collective exhibition, Arteriak en Apetit Gallery, Bilbao, 2012. Exhibition, Getxoarte 2011, Las Arenas, 2011. Exhibition, Concurso de Pintura Hotel Carlton, Hotel Carlton, Bilbao, 2011. Exhibition, KUTXA KULTUR ZIRKUITUA, Arteleku, San Sebastián, 2011. Invited artist, KUTXA KULTUR ZIRKUITUA Junio – Zarautz Octubre – Donosti 2010. Paper | Cyborg Nature. Habitable spaces for the imaginary distance between technology, nature and our bodies. Congress: Representaciones del Espacio Hostil en la Literatura y las Artes, Universidad Complutense de Madrid (UCM), Madrid, 2017. Keynote Speech | Ceramic Artefacts. Concepts and Processes of a Ceramic Art Feminist Practice., Designa 2016 ERRO(R), Universidad da Beira Interior, Portugal, 2016. Paper | To Caress an Image. Deflecting mimesis of body image as a way of subverting biopolitics. Congress: Filosofía y cuerpo desde el pensamiento greco-romano hasta la actualidad, Sociedad Académica de Filosofía, Cádiz, 2015. Master’s thesis lecture | Jornadas de Investigación, Bilboarte, 2015. Article | Ceramic Artefacts. Concepts and Processes of a Ceramic Art Feminist Practice, DESIGNA 2016 ERRO(R), proceedings (ISBN e dep. legal: papel 978-989-654-359-4; pdf 978-989- 654-361-7; ePub 978-989-654-360-0; depósito legal 421707/17.